Hey guys, I’m on the BRI blog today with a cute warm fuzzies monkey card! Stop by & leave me some love! Happy Wednesday & have an awesome Thanksgiving tomorrow! Hey friends! Today I have a card that I made to help a friend celebrate 1000 followers on instagram. I’m taking part in Coralynn’s (@picturethis74) thankful-themed instagram hop. Don’t forget to check out this fun instagram hop! Thanks for stopping by, and happy Monday! These 6 cards feature Lawn Fawn’s recent release. I used Toboggan together and Ready, Set, Snow. I did a lot of copic coloring, distress ink skies, and snow using the Simon Says Stamp falling snow stencil. For the next 6 cards, I used Wplus9 Holiday Boughs stamp set, Hero Arts Family and Friends stamp set, and Essentials by Ellen Mondo Poinsettia by Julie Ebersole stamp set. I did more copic coloring and lots of gold embossing. For the next 6 cards, I used Mama Elephant Merry Script creative cuts, Mama Elephant Charmed stamp set, Simon Says stamp & Clearly Besotted collaboration Holiday Banners stamp set, and Tim Holtz Holiday Knit layering stencil. I hand wrote a holiday message inside each card, signed my name, and included my state with a gold sharpie marker. Have you participated in this card drive? You still have time to get your cards in! You have until Nov 27 to send in your cards, whether you decide to send 1 or 50. If you have any questions, leave them down below! Thanks so much for stopping by! Hey guys! 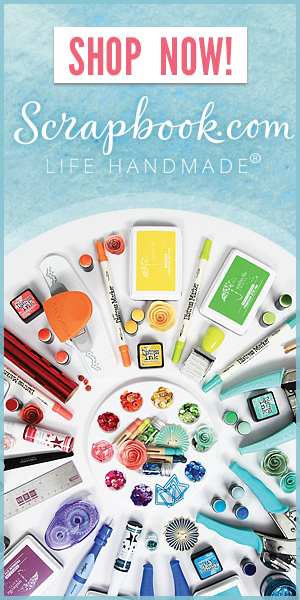 I’m on the BRI blog with a fall shaker card. I hope you’ll stop by and check it out! Hey guys, I’m on the Butterfly Reflections Ink blog with a holiday card, using a quick technique for a watercolored look. Come see how I did it on the BRI blog, and don’t forget to visit the shop! Hey guys! I’m here to share some handmade kindness. If you haven’t heard about Jennifer McGuire’s Share Handmade Kindness Challenge, you can read about it here. I made this card using My Favorite Things Fall Florals stamp set and matching die-namics. I also used Hero Arts Ombre Ink Pads in Light Ruby to Royal Red, Butter to Orange, pink to red. 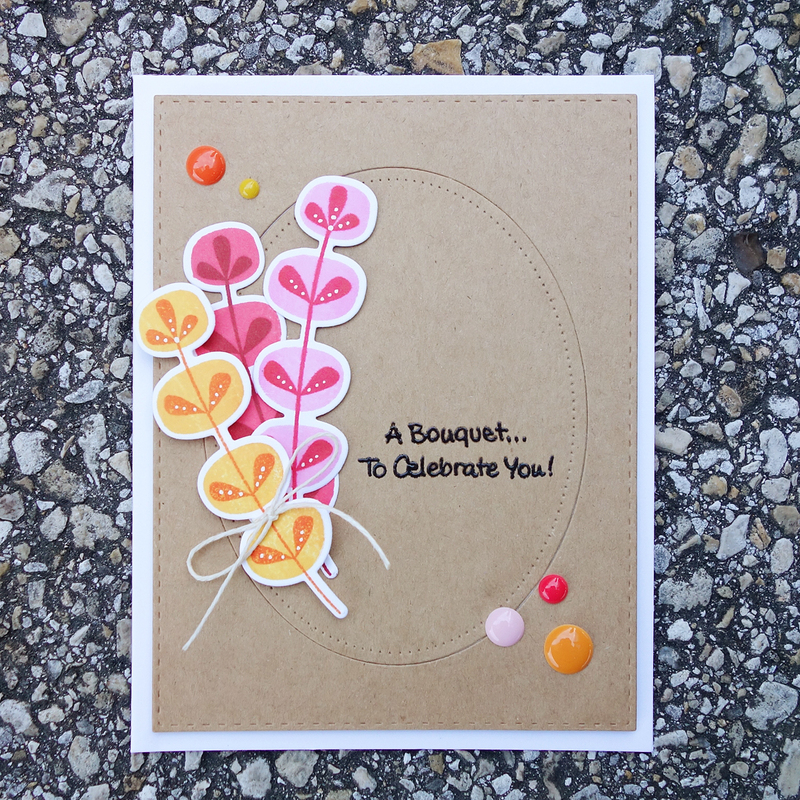 The sentiment is from Stampendous Bouquet for You stamp set. I also used Simon Says Stamp stitched rectangle dies and the oval is from Avery Elle’s sweet scallops elle-ments die. I finished things off with a twine bow and enamel dots! I believe with this particular company, you’re supposed to stamp the image after you die cut it first. I like to stamp my image first, and then die cut my images. I am not that great at lining up my stamps, so I had to figure out a way to make these dies work for me. I had seen a few card makers cut the die out of cardstock to use as a template. I was doing it that way too, but got tired of making that template every time I used the dies, and having to throw them away. I decided that I needed something more sturdy. I grabbed one of my daughter’s plastic folders brought home at the end of the previous school year, and die cut all the fall floral die-namics. I cut a little slit in one side, so I could pull it away after fitting my die in place. As long as you hold the die firmly in place, you should get a great lined up cut! For storage, I put all my dienamic templates in a little ziplock bag, and labeled it at the top! I hope that make sense. If not my words, maybe my pictures will help you out! 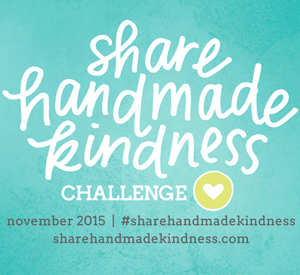 Thanks for stopping by, and I hope you join in the share handmade kindness challenge! Hey guys! 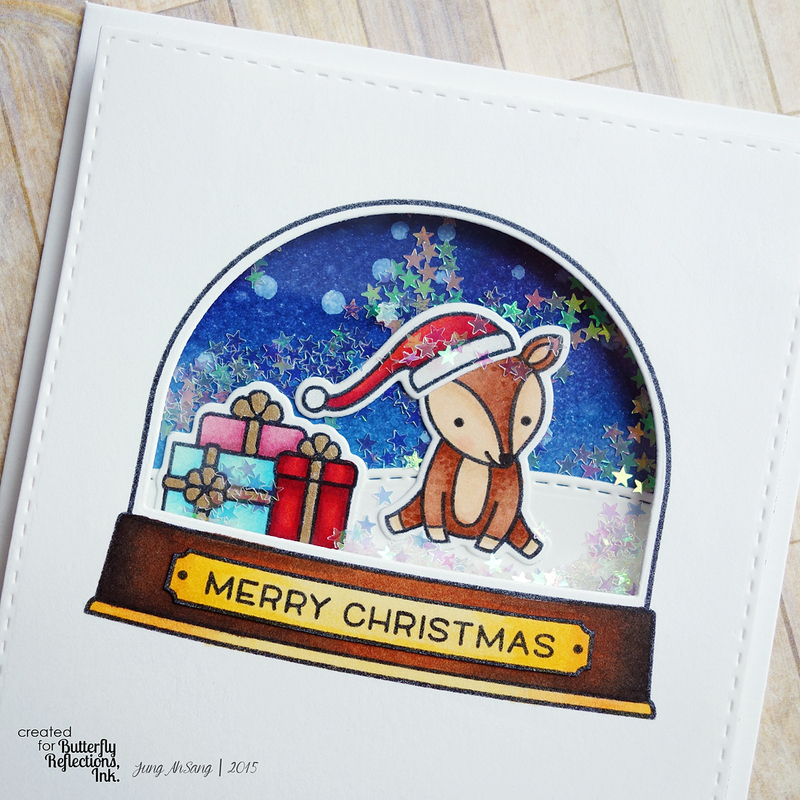 I’m on the Butterfly Reflections Ink blog today with a cute Christmas snow globe shaker card featuring Lawn Fawn’s recent release. I hope you stop by to check it out, and don’t forget to do a little retail therapy in the shop!